After some struggling, Dad got off the bike. “You ride it to the top. I will meet you there,” he said. This is not acceptable! Not for my giant! I stared at him, froze at the spot. “Go. I will meet you at the top,” he said again. I took the bike, quickly turned around and rode away. I didn’t want him seeing my tears. I didn’t want him to know that I knew that he wasn’t a giant. This entry was posted in Cee’s Black & White Challenge, Memoir, photo, Writing. Bookmark the permalink. 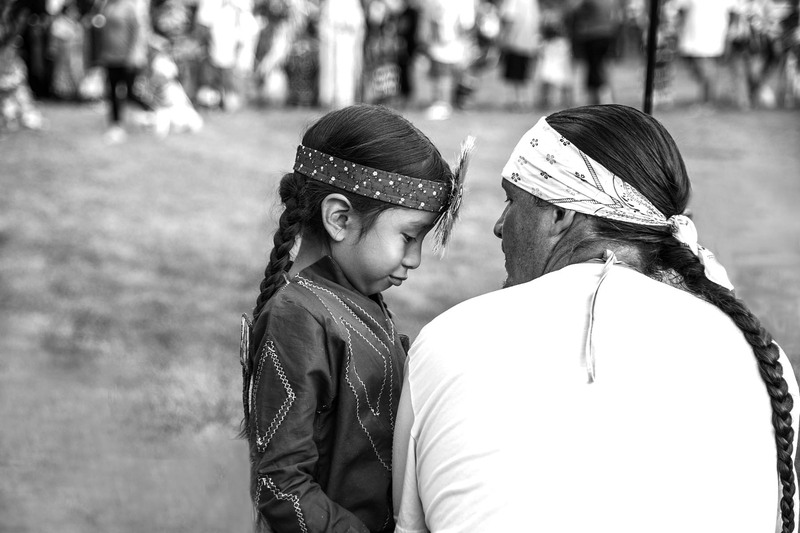 The little girl really enjoyed the Pow Wow. It was a big event. The journey children go on learning their parents are not giants is sometimes sad, like learning there is no Santa Claus. Dawn, I felt very sad that day. It was one of the days that I can’t forget. Then they grew older and I found out that I might have become a giant for them. 😉 Life is interesting. It is indeed, more so I think for those of us who feel so deeply. This touches me. My dad has always been my giant and “go to” man. Now aging is kicking in and he is struggling with health and the onset of dementia. He knows something is not right and feels helpless to do anything about it. We watch his frustration and now it us kids that have to offer the hugs and try to fill his giant shoes. I am so sorry… but you know what? I bet your dad would tell you that he had a wonderful life and no regrets. My parents told me that. Thanks for your comment. Be strong! Helen, I ‘liked’ the picture and the extraordinary words you wrote. Your dad was allowing you to be the giant that day; I can see your sadness, and think he probably felt the same as you. Thanks, Lois. I was young at the time. I thought if I wiped the tears away, Dad wouldn’t notice a thing. Now I think about this… I am not very good in hiding my emotions particularly when I am in shock. I bet my dad knew how I felt even though he didn’t say a word to me. Helen this childhood memory obviously is very strong. The realities of adulthood can definitely be heartbreaking. Thank you for sharing it. The photos is fantastic. Thank you, Sue. It was a heartbreaking moment for me. However, we had many good years after that, so I don’t have any complains. Still thinking about your trips. I send your URL to my daughter, hoping she will take me there. Ha. Thanks, Ruth. I want to write down as many stories as I can. Blogging helps. Thanks for reading it. Thanks, Cee. I wish I were smarter so I would say the right words at those situations. To the minimum, as soon as I realized he couldn’t make it to the top, I should get down and maybe even push the bike from behind. I worried if I would hurt his feelings if I jumped off the bike but… Sometime I think i’s better if I don’t think too much. Thanks, Trudi. I am getting better in making a decision if a photo should be color or black and white, but there are still some photos that I like both ways. This is one of them 😉 Thanks for your kind words. A touching story, Helen. This photo tells “Every little girl thinks her dad is a giant”. Beautiful photo and story. Realizing our fathers are mortal is a troubling childhood milestone isn’t it? Thank you for sharing your experience! Thank you, RMW. You are right – it was a milestone… one that I wasn’t ready for at the time. Its hard to realize our heroes are only human….especially when we love them!! Beautiful “human” story in such a short anecdote. Thanks for sharing. That is a very touching and poignant story. I don’t know that I ever felt that my Dad was a giant or not a giant; but I always thought he could fix every problem in my little world and he usually did. Life is filled with such moments. Beautiful post Helen, the photo along with your words of a daughter-father love is touching and is such an important part of life. Thanks, Randall. My feeling is that the our daughter-father love was very subtle (since both of us were quiet) comparing to other’s. Still, I knew it was there. @HelenC. Your post has echoed in my mind through the Summer and often since you originally posted, how often the opportunity for relationship to mature and stay the same somehow. To my readers, visit Helen’s blog and enjoy! Thank you so much for your kind words and reblogging. I appreciate it. Writing helps me connect to people I miss, believe it or not. And your comment comforts me. Thank you! My Dad was diagnosed with Parkinson’s many years ago. My Giant has been deteriorating mentally and physically before my eyes for a long time. But, he found ways to re-create that Giant status in how he deals with his everyday challenges that the disease has created as his new reality. I am so sorry to hear that. It must be hard for you! A year before my dad passed away, he was hospitalized. I remember seeing him curling up like a little baby. I wanted to pick him up in my arms, rocking him to comfort him. He was no longer a giant, but still, I love him so much. I really love the photo, and the expression on her face!